Today, manufactured homes are built with quality craftsmanship and materials. They are built by professionals in controlled environments, helping them produce excellent products with less waste. These newer homes often include modern and luxury upgrades like granite counters, stainless steel appliances and garden tubs. They are built using strict guidelines, so in many cases they are just as safe, or safer, than site-built homes. It’s easier than ever to get financing for a manufactured home, especially for newer homes. That’s why we think purchasing a manufactured home is even better than renting, especially if you’re in an apartment. Here’s just 5 reasons manufactured homes are better than apartments. Let’s face it, manufactured homes get a bad rap. Even though modern day manufactured homes are totally different than their predecessors, people still can’t get over those old homes. But when it comes to making investments, we think mobile homes are better than apartments. If you’re renting an apartment, it’s a good time to consider purchasing a mobile home. When you buy a mobile home, it’s yours. You can paint the walls and customize your home any way you like. Plus, you aren’t in close quarters with your neighbors. You learn all too quickly the schedules and habits of your neighbors in an apartment. Buying a manufactured home gives you a space that’s all your own. In most cases, you’ll get more square footage, more storage and more options per dollar on a manufactured home than on an apartment. Today, manufactured homes often have two bedrooms and two bathrooms, a storage shed, a patio and large living areas. They feature open floor plans that create light and cheery spaces. Often times, you’ll pay more for rent in an apartment than you would for a mobile home mortgage. You’ll have the added advantage of knowing that your money is going to your home, not to your landlord. The backyard on a mobile home located in Rolling Greens. Not having a backyard is one of the most bothersome aspects of renting an apartment. When you purchase a manufactured home, you’re getting a backyard that you can enjoy. Whether you have dogs or just like to grill out on the weekends, a backyard can make a big difference. When you buy a manufactured home in Florida, you’ll find that you can spend a lot of summer nights enjoy your backyard. Plus, many manufactured homes come with screened in porches that feature ceiling fans, so you can be outside even on hot dogs. Invest in a corn hole game and invite neighbors over for a BBQ! 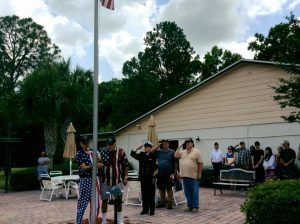 Residents raising the flag in honor of veterans in their community at Tuskawilla Trails. Living in an apartment complex can make you feel very isolated. Often times you hardly see your neighbors and chances are you’ll never meet them. In many manufactured home communities, there are events, social activities and a true sense of community. Whether you’re a young family or enjoying retirement, a sense of community can keep you grounded. In Newby Management communities, we strive to create a strong sense of community through social activities. It fosters a family that many people don’t find in other communities. Renting an apartment can be a great option in the short term. It gives you flexibility if you aren’t ready to move to a permanent location. But when you’re ready to make a permanent move for your family or in retirement, buying a mobile home is a great option. It gives you so much value for your money, and you can feel more secure as a homeowner. 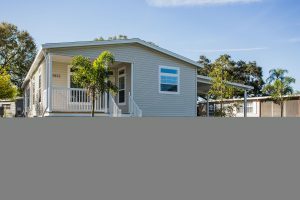 Looking for the truth on new manufactured homes? They aren’t what they used to be. You’re thinking of your grandma’s trailer. You know, the one full of chotskies and lacking a certain modern flare? Get ready to be amazed, because new manufactured homes are bold, beautiful and better than ever before. There are tons of options for 2016 manufactured homes, but today we’re going to look at Skyline Homes. Skyline Homes is proud to present new 2016 manufactured homes that meet rigorous building, environmental and safety standards. These homes are not only beautiful, but are built to last. From the roof to the siding, you can be sure you’re home is top notch. To back the quality of their homes, Skyline offers warranties with their roofs (25 year prorated warranty), the durable vinyl lap siding (limited lifetime warranty), and even a 15 month full home warranty, which you can learn about below. Skyline Homes features floor plans and options to fit a variety of needs and budgets. Homes can include everything from granite counters and tray ceilings to stainless steel appliances and beautiful raised porches. You can choose from flawless vinyl wood flooring, large bathtub s, exquisite kitchen islands, open floor plans and a variety of modern upgrades to make your home uniquely yours. Save money on your electric bill with energy efficient homes. 2016 Skyline homes are built with state-of-the-art floor, ceiling and wall insulation that help keep the home cooler in summer and warmer in winter. Skyline is an Energy Star partner, which means they’ve used Top-Grade Insulation, Extensive caulking and tight construction to eliminate unwanted drafts, High-Performance Windows and Doors, Use Energy Star approved materials including low-escape air ducts, so you can be sure your home meets energy efficient standards! Every new Skyline Home is backed by Skycare, a full 15-month warranty. This warranty is not partial or limited and includes manufacturing defects reported to Skyline within 15 months after original retail delivery by an authorized dealer will be corrected without charge and within reasonable time. The mobile home industry is riddled with myths. Some are big, some are small, but most of them are not true. We are going to debunk just a few today. Many people think of mobile homes as they were in the 1960’s. Today, the standards are much higher, making many manufactured homes comparable to site built homes. 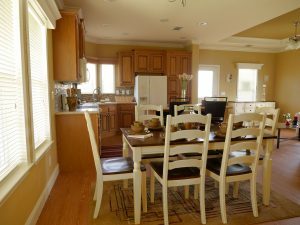 In fact, these homes often have high end upgrades including granite counters, stainless steel appliances and more. They abide by safety standards that, in many cases, surpass those of site built homes. Not to mention they produce less waste and cost less too. These days, manufactured homes are an affordable and quality option for people who want to purchase a home. At Newby Management, we are working to upgrade some of our older homes, along with bringing in brand new homes built in 2015. This gives options to people who are looking to spend a little less, or for people who have a little extra in their budget. Either way, you’re getting a high quality home you’re sure to love. If you watch the nightly news it can surely feel like more mobile homes are burning down than any other type of single-family housing. But the truth is that manufactured homes are no more likely to catch fire than any other type of home, according to an annual report released by the Oklahoma State Fire Marshall’s office. A national fire study conducted by the Foremost Insurance Company showed that site-built homes are more than twice as likely to experience a fire compared to manufactured homes. This study stated that the number of home fires is 17 per 1,000 for site-built homes and only 8 per 1,000 for manufactured homes. This is only one example of a home builder who produces new energy efficient mobile homes. But here’s the deal, energy efficiency is a relatively new thing, and while manufactured homes a being regulated for it, site-built homes still aren’t. So the truth is, new comparable site-built homes are going to be less energy efficient than new comparable manufactured homes. This myth prevents so many possible homeowners from owning the home of their dreams. For new manufactured homes, some buyers are able to finance their homes through the retailers when they purchase. Today, big financing companies like Wells Fargo offer manufactured home financing. Also, under the Title I program, FHA approved lenders make loans from their own funds to eligible borrowers to finance the purchase or refinance of a manufactured home and/or lot. You can learn more about financing by visiting HUD’s website to see what qualifications buyers need to meet. 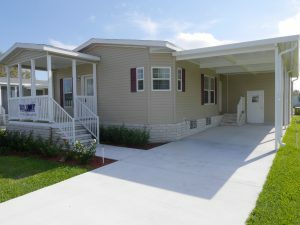 If you’re looking for a brand new manufactured home like the one pictured in this article, visit Newby Realty to see some of the options we have in beautiful communities across Florida. 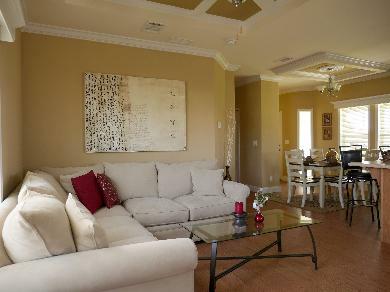 SEE THE BRAND NEW SKYLINE PALM BAY HOME PICTURED HERE! We all know the stigmas associated with mobile homes. Here’s the thing, most of these aren’t true anymore. There’s a huge difference between parks of the past and parks of today. Today, we’re going to debunk 5 myths that you’ve heard about mobile homes that just aren’t true. Manufactured homes get a bad rap for being fire-prone. In fact, the media seems to just love writing about them catching on fire. This, combined with the idea that mobile homes are more likely to catch fire makes people believe it must be true. Today, the fire resistance provisions of the HUD code have strict standards for fire retardation and smoke generation materials, large windows in bedrooms, smoke alarms and at least two exterior doors which must be separate from each other and reachable without having to pass through other doors that can be locked. On the other hand, site-built homes do not have such strict requirements. The truth is, fires can happen anywhere and today’s mobile homes are no more at risk for fires than comparable site-built homes. Many people seem to believe that manufactured homes aren’t constructed as well as site-built homes. In reality, site-built and manufactured homes are built out of the same materials, just not at the same locations. Although they aren’t built at their final location, manufactured homes are sturdy and follow the same and often stricter HUD building codes than site-built homes. 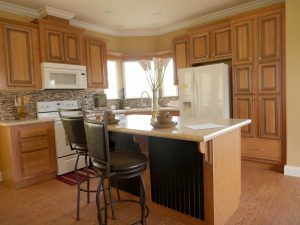 Many of our renovated homes include features such as cherry wood cabinets, granite counters, stainless steel appliances and more. These homes exude both quality and beauty. The truth is, a few places give manufactured home communities a bad name. There are definitely some manufactured home community operators who care more about profits and let an aging community fall to the wayside. However, you’ll also find a great deal of community managers like Newby Management who places great importance in capital improvements and putting people before profits. For example, in our premier communities like Camelot Lakes, Camelot East and Rolling Greens we are currently working on big capital improvements that will benefit the entire community. We also are always working to update the home inventory. There are many operators and managers who take the time to ensure that communities are kept up-to-date and beautiful for residents to enjoy. The housing market in which the home is located, will have a significant impact on the future value of the home. The community in which the home is located, has a similarly significant impact on the home’s future value. Any home that comes out on the positive end of these factors is likely to appreciate, whether the home is manufactured or built on site. 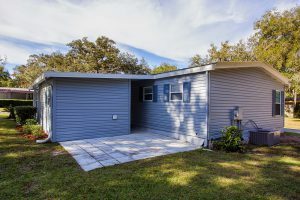 If you’re hoping your manufactured home will appreciate over time, consider the factors listed above when making your purchase. When mobile homes first came into the market they were used as quick, cheap housing for people in need. Eventually this style of home broke into the mainstream market and became what we know today. When this happened, HUD standards, quality standards and societal standards were placed on manufactured homes. Today, there is hardly any difference between a site-built home and a manufactured home. The quality of manufactured homes, along with the price, make them an amazing affordable housing option. However, they are no longer only a housing option for people with financial troubles. More and more they are becoming smart decisions for people looking to own a home without getting into a ton of debt. You’ve heard of the Millennials. The good, the bad and the ugly. But what you probably haven’t heard is that Millennials are choosing to live in manufactured homes rather than site-built homes. Why is this trend happening? When Millennials were entering the workforce they were doing it at the height of the depression. Many struggled to find jobs in their industry, forcing them to accept any job that came their way. Although the economy seems to be pulling through, many Millennials are looking to be more conservative with their money, eschewing living beyond their means. This generation of individuals get a bad rap for wanting everything “now”. One credit we can give this up-and-coming people is that they are treading much more lightly on the earth than previous generations. They are looking for homes that are smaller and more reasonably priced. They are not as concerned with large homes, often looking to purchase homes less than 900 square feet. Manufactured homes today are producing less waste and are more energy-efficient than site-built homes. For many people in the younger generation, this is a huge draw. As manufactured homes start to lose their stigma, Millennials are beginning to realize that these might be the perfect dwellings for their needs. Plus the energy-efficient homes often save on monthly costs as well. This generation is probably among the least concerned with labels. 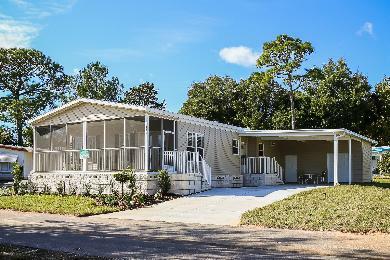 This makes them an ideal buyer for manufactured homes. Unfortunately, this type of home has gotten quite a bad reputation, and it’s one that many can’t seem to shake. Luckily, millennials are a group who isn’t interested in labels, therefore, they see manufactured homes for what they are: affordable, green, great places to live. Owning a home is part of the American dream, but that home has to be a 4 bedroom, 2 bathroom, 2 car garage with a pool and a place for the dog to run. For the Millennial, the American dream is a wide-open road with plenty of options and variances. They means they see the potential in living in a manufactured home. They see the dream in those walls, they see a future. They see a place they can call their own without strapping their savings. And that is something to get excited about. Why Does a Property Management Company Have a Aerial Drone Camera? Photos. Videos. They are the new mediums, quickly taking the place of words and stories. It’s how people share information, how people see the world. Think of the newest social media platforms like Instagram and SnapChat. They revolve around pictures and videos that tell a story. So, why does a property management company have an Aerial Drone Camera? To tell your story. Whether you own a manufactured home community, or invest in one, you likely want to promote the community. But today’s seniors aren’t looking for just any manufactured home community. They are looking for something with life, vibrancy and activities. They want to be sold a lifestyle. That’s what we do. Our corporate photographer has over a decade of experience capturing the beauty in moments and scenery. We hired him to our team in 2014 to showcase our communities in a unique way. Once he started to produce beautiful still imagery, we got the wild idea to create professional videos. 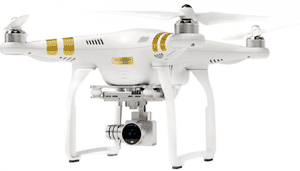 Enter the Phantom 3 Professional Drone, a state-of-the-art, light-weight , multi-functional integrated aircraft and camera. 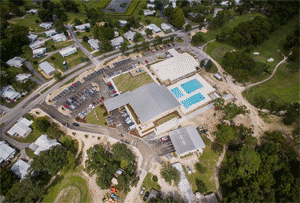 With this new technology, our marketing team can produce high-definition aerial videos and photos that take the viewer above and beyond. Normally, these would cost your community thousands of dollars with planning, production, editing and promotion. At Newby Management, we have the in-house capability to handle all of this for you. We will assess your manufactured home community and determine the perfect promotional video. Our in-house marketing team then comes together to create a voice over and shot list. Jake Bibler, our corporate photographer, then goes out and shoots the footage. So far, we have created promotional material for several communities that feature sweeping shots, creative videography and stunning photography. Once the video is finished and approved by you, we promote it on various social media platforms. Our in-house web developer also adds the video to your website so viewers can watch it directly from your page. If you wish, we can also promote the video through pay-per-click advertising to reach even more viewers in your demographic. What is the Difference Between a Trailer and a Manufactured Home? 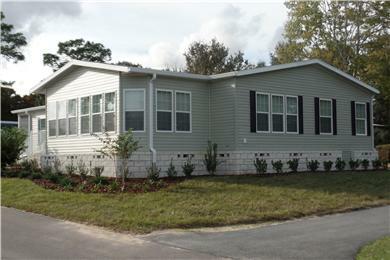 New Manufacturd Home available at Camelot Lakes in Sarasota, Florida. The term trailer in reference to a dwelling originated from the popularity of travel trailers in the 1920’s. These were vacation trailers similar to airstreams and campers that were towed behind a vehicle. Through the years these became wider, longer and more elaborate. By the 1930’s, many people were living in these year round, and they soon became known as “house trailers”. These were no longer meant for travel, but as a permanent dwelling. In the 1950’s, the term mobile home was popularized to more accurately describe the dwelling. In 1975, the Mobile Home Manufacturer’s Association officially changed it’s name to the Manufactured Housing Institute. Here’s the thing, even the terms mobile home and manufactured home are not interchangeable. A mobile home refers to a home built prior to 1976 when the HUD code governing building standards for factory-built homes was instituted. Following this, the quality of homes improved greatly. Homes built after 1976 are considered manufactured homes, and have similar building and quality standards of comparable site-built homes. HUD standards regular manufactured housing design and construction, strength and durability, transportability, fire resistance, energy efficiency and quality. Furthermore, there are standards for heating and plumbing, air conditioning, thermal and electrical systems. Manufactured homes of today are giving America back affordable housing options. They are rivaling their site-built counterparts in nearly every arena/ At Newby Management, many of our new 2015 models include granite counters, hard wood floors and garden tubs that make a house a home. THE WEB– If you don’t have a website, you’re losing potential residents. Websites will help you market your community to a global audience. It’s gives you a sense of professionalism and gives viewers information they might not have otherwise. It will also save your workers from answering the same question over and over. Learn more about why your mobile home community needs a website. 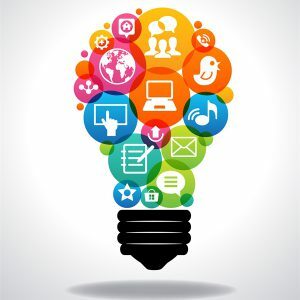 SOCIAL MEDIA– More and more people are turning to social media for information about businesses. They want to see the personality of your business, especially if they are planning to move there full-time or even part-time. People like to see pictures of events, activities and the residents who live in your community. Often times, people will even go to your Facebook page for information about your community like hours, location and more. Keeping an active Facebook page is a cheap way to promote your community! HOME LISTINGS- Post homes for sale in your community to multiple locations like Zillow, Trulia, and Craigslist. Doing this will allow the most people possible to see your mobile homes for sale. This will also direct people looking for homes to your community website. Learn more about how to sell your mobile home quicker. GOOGLE ADWORDS- If you’ve ever been on Google before you’ve see the ads on the top and right-hand side of the screen. These are cost-effective ways to target an audience who is definitely interested in your product. Many people falsely believe that no one clicks on Google ads, but they are used when done well. Although it’s still great to have a high organic listing, getting yourself on the first page of a Google search for keywords like “mobile home communities in Florida” is a great way to drive traffic to your website that is qualified. BLOGGING- Most blogging sites like WordPress and Blogger are free. Who knows more about your community than you? Plus you have insider information on the manufactured home industry that no one else has. Blogging is a great way to use keywords, share information and drive traffic to your website. You’ll set yourself as an information leader in the industry and show people that you have the knowledge and expertise they are looking for when purchasing a home. Are you wondering how you can get started marketing your manufactured home? Newby Management can help! We have a full-service team of professionals who handle everything from blogging and professional photography to social media and online advertising. Our team is expansive and dedicated to seeing your community grow and flourish. Visit our website to see what else we can offer you.